For your reading pleasure and learning, BelleAire Press wanted you to know about the following books that have been recently published, or are nearing publication, all of them available as digital publications. “Flavors” is now available as an EPub. You can now read it on your iPhone or iPad. The rich color photographs of holiday foods and breathtaking Norway will be yours to enjoy. 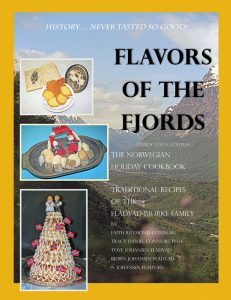 Flavors of the Fjords is the first Norwegian holiday cookbook and includes many cookie and cake recipes never seen in “American” or “Scandinavian” cookbooks. Authentic, mouth-watering, easy-to-prepare Norwegian holiday recipes updated (and tested) from an original, 19th-century manuscript cookbook written by a beautiful immigrant to Newport , Marie Fladvad Cottrell. PeeWee, the Clark’s Hill Cat narrates his story as the feisty owner of the Raymond Family of Stamford, Connecticut during World War II. 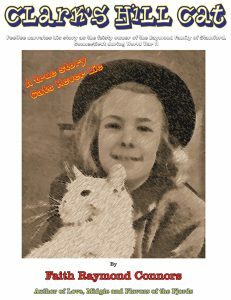 The BelleAire Press “Cat-itorial Review Board” recently granted its CRB Seal of Excellence to a new work of feline historic fiction by Faith R. Connors, author of Flavors of the Fjords and Love, Midgie. Pee Wee, The Clark’s Hill Cat is a cat’s tale, as told by himself to Connors. Actually, the story was the outcome of Connor’s discovery as a young girl that she knew what her cat was thinking. The result is a gripping tale of cat life in the Raymond household in Stamford, Connecticut during World War Two. From blackouts and Victory Gardens, to Sailors “borrowing” the family car, Pee Wee shares his unique experiences and outlook. Come along with me. Rhode 53 Island offers an excursion back in time as we visit family members vacationing in simple shore cottages of a mostly bygone era. Many members of our family including parents, grandparents and quite a few children spent summers in rental cottages at the Rhode Island shore. …Even the hours spent in the back of my uncle’s car were out of the ordinary. Did I want to go? Oh, yes! All of the stops along the way were special, including Bishops in Guilford, Connecticut; Kenyon’s Grist Mill in Usquepaugh, Rhode Island and Westall’s, a bakery at the top of the road leading to the Jamestown Bridge. I hadn’t been to Rhode Island since age ten when Mother and I took the bus from Stamford to Newport where we stayed with Mother’s first cousin, Louise Cottrell, in her home on Boulevard. Louise was Head Librarian at then Peoples Library, a position that she eventually held for fifty years. Our destination, by bus in 1949, was also Mother’s hometown where she was born at home on in an Italianate house on Pelham Street in 1905. In 1953, our destination is Jamestown, Conanicut Island, a place I’d not visited since toddlerhood in 1941. 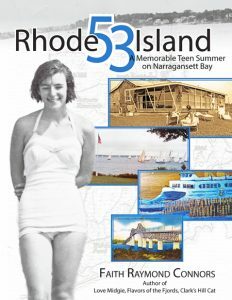 Rhode 53 Island recalls a magical summer on a wild, beautiful island in Narragansett Bay, as the author tells you more about her Newport family history and roots. Leading at the senior level is tough and fundamentally different from leading at lower levels, this guidebook by Dr. James W. Browning (“Leading at the Senior Level”), provides a roadmap for personal and professional success as a new senior leader. This unique guidebook of approximately 80,000 words weaves important insights, anecdotes and advice gleaned from discussions and interviews with more than 60 well-regarded senior leaders in business, government, military, and nonprofits, as well as from literature research and the author’s own senior-level transitions. The insights and suggested action steps gained will assist aspiring or current senior leaders’ efforts to avoid the mistakes of others and gain from their successes. “Leadership” is accorded near-mythic qualities of Saintliness. Do mere mortals need apply? Yet, nearly two of every three change initiatives (leadership) fail. Since successful, effective Leadership is three-dimensional–Purpose, Environment, and Personal Competencies–it’s time we saw and understood what’s really happening during Leadership. It’s time for an Advocatus Diabolic, a Devil’s Advocate, who explains the elements of this three-dimensional construct of Purpose, Environment/Situation, and Personal Competencies. Dr. Tracy D. Connors, CAPT USN (Ret), the author of seven management handbooks, including the first for the nonprofit sector, explains the relationships between Purpose, Environment, and Personal Competencies, and offer tools you need to better understand how to improve your own results and outcomes, as well as those of your organization. Kings Ferry, Florida on the south bank of the St. Mary’s River a few miles east of present-day U.S. Rt. 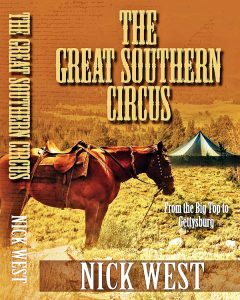 301, in 1800 was part of a huge Spanish Land Grant that brought settlers into this foreign land from nearby Georgia. Included in that wave of early settlers were members of the Haddock, Higginbotham, Libby, Carleton, Braddock, and Vanzant Families. Kings Ferry Cookbook shares the recipes, lore, and photographs from many of their descendents, recipes cooked and enjoyed by my Haddock relatives. Our appreciation for certain foods is often connected to the people who are most closely associated with certain foods and the special ways in which they were prepared. This is certainly the case with the Haddocks and the other pioneering families of this region.